Bayern Munich is the most successful club in German football’s history. Bayern has total 26 Bundesliga Titles, 18 German cup titles beside it’s name. Bayern has also won 5 UEFA Champions League titles. Bayern won the UCL 3 consecutive times in 1974,1975 & 1976. They won their 5th UCL title in 2012-13. Bayern Munich is the current champion of German Bundesliga, who has won it 4 consecutive times in last 4 seasons. The Bavarians are also the most popular club in Germany. Bayern Munich has more than 39.9 million followers on Facebook & more than 3 million fans on Twitter. Wage Bills: According to the reports, Bayern Munich’s wage bill is estimated around €180 million. Bayern Munich has the most valuable squad in Bundesliga. 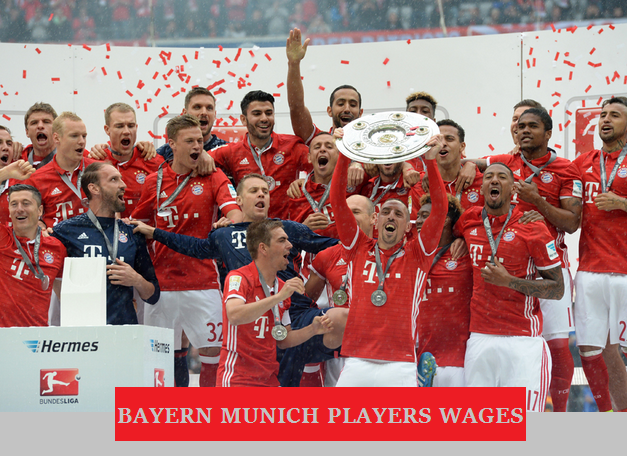 Bayern Munich also has the highest wage bill in Bundesliga. Highest Paid footballers: Bayern’s Polish superstar Robert Lewandowski is the highest earning player in Bayern squad along with Dutch winger Arjen Robben & French winger Frank Ribery. All 3 of them earn €160,000 per week. German duo Manuel Neuer & Thomas Muller get €150,000 as weekly salary. Major Transfers In 2016-17 : Some stars like Mario Gotze, Sebastian Rode, Piere Emile Hojbjerg has left the club but Bayern has signed some big names under Carlo Ancelotti had taken the place of Pep Guardiola. Bayern has signed Germany international Mats Hummels from league rival Borussia Dortmund for €35 million. Portugese young gun Renato Sanches has also arrived for €35 million from Benfica. Bayern Munich is the biggest club in Germany. It is the most successful club in the country & highest paying club in the homeland of Franz Beckenbauer, Oliver Kahn, Gerd Muller. Thus they don’t have any shortage of money to pay such high payments to the footballers.